1. It has actual blood circulation function produced by hemodynamics. Blood output speed could be adjusted accordingly. The upper limbs could be rotated 180°. It supports intravenous injection, infusion (blood transfusion), drawing blood, intramuscular injection on deltoids. 2. Hemodynamics controlling installation has built-in batteries. So no need to attach external power, which is portble. 3. 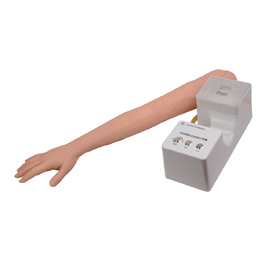 It is available to conduct “one-touch” to quickly inject liquid, clean and evacuate. Pulses speed could be adjusted.